Opening hours: Generally, stores & shopping mall are open 7 days a week, late night shopping on a Thursday night until 9 pm. Sunday from 4–5 pm. Closed only Christmas Day. Open Mon-Fri from 8.30am – 6pm. Weekends and Public Holidays: 10am – 6pm Closed Good Friday, Christmas Day & New Years Day. 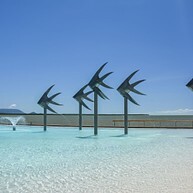 Cairns offers endless possibilities to explore, learn and meet interesting people. The nature is breathtakingly beautiful and the people friendly and helpful. There’s always something exciting going on and if you’re all adventured out, there are plenty of options when it comes to taking it easy, and hey - why not get a nice tan while you’re relaxing? The Esplanade is full of cafés and restaurants and there are also bbq areas where you can sit down with friends and use the big grills. Stroll along the promenade, splash around in the famous lagoon, enjoy some of the free events or just soak up the sun! No trip to Cairns would be complete without a day spent exploring the Great Barrier Reef. One of the largest and most experienced reef cruise operators is Quicksilver, which operates daily cruises to the outer reef and islands from Cairns and Port Douglas. The company has over 50 Great Barrier Reef dive sites and eleven major vessels in its fleet. Discover the aboriginal cultural park, showcasing the culture and beliefs of the rainforest people of Tropical North Queensland through theatres, stage shows, boomerang/spear throwing and bush medicine. This well-organised event is truly entertaining and educational and should not be missed. There are three rivers in Cairns suitable for rafting, each with its own degree of difficulty. It is a great experience and also team building to face the impressive rapids together. 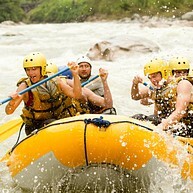 RnR White Water Rafting is a white water rafting specialist in Australia and they offer a wide range of different tours. Jungle Surfing is located on a private reserve 2,5 hours drive north of Cairns. 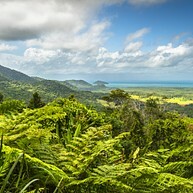 The property borders the Daintree Cape Tribulation National Park and offers stunning rainforest as well as views over the Great Barrier Reef. Jungle Surfing is an exciting and adventurous way to experience the spectacular Daintree Rainforest and being up there in the canopy gives you unparalleled access to the heart of the rainforest. 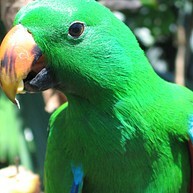 Meet the animals and learn about the fragile ecology of the rainforest right in the heart of Cairns. This spectacular wildlife exhibit is enclosed by a 20-meter-high glass dome on top of the Reef Hotel Casino. Be surrounded by birds such as parrots, cockatoos, lorikeets, doves and rosellas and see for yourself how cute the rainforest wallabies are. Here, you will also be able to experience the world's first challenge ropes course in a wildlife park. Learn about Aboriginal plant use and wonder at the flora and fauna at this tropical oasis of 38 hectares of native Autralian gardens. 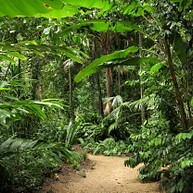 The Cairns Botanic Gardens area is divided into four distinct areas: Flecker Gardens, Centenary Lakes, Mt. Whitfield Conservation Park and Tanks Art Centre. Experience the splendour of this World Heritage listed rainforest, this is the oldest tropical rainforest and a home to diverse and unique animals, plants and fungi. At around 1.200 km² the Daintree is the largest continuous area of tropical rainforest on the Australian continent. A beautiful place where to listen to birds and swim at calm beaches and where to enjoy the wonder of the nature while finding an inner peace. 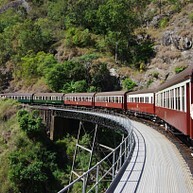 Board the famous Kuranda Scenic Rail for a breath-taking journey on one of the world’s most scenic operational rail journeys to the charming town of Kurunda and a return journey by cable car across the canopy of the rainforest. With the cable car, you will get an amazing birds-eye views so make sure not to forget your camera. The Cairns Historical Museum houses an exhibition displaying the history of Cairns starting with the Aboriginal and Islander beginnings as well as the early timber, mining and agricultural industries. Housed in a landmark heritage building, Cairns Regional Gallery is the region´s leading gallery, featuring historical and contemporary art made by national and international artists. 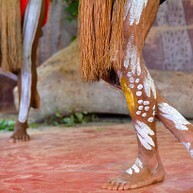 There is also a permanent collection, showcasing unique history and living cultures of Far North Queensland. 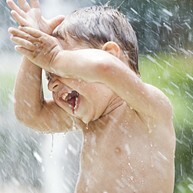 A water playground and parkland, Muddy's is located right on the Esplanade, making it easy for you to find. It is a great place for the kids to run around, play and release some energy. There is a café for the parents to sit back and relax with a cup of coffee. The oldest golf course in Cairns, the Golf Club offers a lovely course and located only five minutes from the city centre. The 18-hole course is set in tropical surroundings with lovely views and a rich bird life to enjoy while playing. There is also a driving range onsite.